As of September 20, Texas-based EnviroGLAS has become ‘Glass Recycled’ – a corporate strategy that will reflect it’s expanded scope and service to the commercial and residential building products industry. Glass Recycled features a patented process of recycling and transforming glass and porcelain into beautiful, sustainable applications for floors, walls, recycled glass countertops and specialty décor items. As of September 20, Texas-based EnviroGLAS has become ‘Glass Recycled’ – a corporate strategy that will reflect it’s expanded scope and service to the commercial and residential building products industry. With this name change comes the creation of four distinct brands under the ‘Glass Recycled’ umbrella – offering architects and designers the ability to create totally custom combinations for floors, walls, recycled glass countertops and specialty décor items. ‘Glass Recycled’ not only reflects these many added applications but further communicates the company’s philosophy of creating stunning products that are as were as environmentally friendly as they were beautiful. Glass Recycled’s major premise is taking unused glass and porcelain products of all shapes, sizes and colors and combining them in a unique epoxy system to create a granite-like product that has the added benefit of total customization in both color choices and final use. Like granite and other terrazzo-like materials, Glass Recycled products are extremely durable and sophisticated but offer the added benefits of unlimited size and color combinations. Hundreds of clients have already enjoyed the benefits of this sustainable product in major commercial and residential uses including flooring, wall panels, bars and countertops, bathrooms and landscape accents, as well as one-of-a-kind decorator touches including art-like murals and company logo uses. Glass Recycled has created four sub-brands including GlassSLAB is a stunning product suitable for kitchen countertops, bathrooms and other countertop applications in a variety of sizes, GlassPLANK is the company’s unique flooring and wall panel products that can be installed with seams as little as 1/64” and available in a variety of sizes and thickness, GlassDECOR is uniquely designed interior products that may include recycled glass table tops, glass panels, ceiling tiles and other imaginable applications and GlassSCAPE – a recycled glass landscaping material, which is loose, bagged recycled glass and porcelain aggregate product that can be used as a permanent and beautiful alternative to groundcover, mulch or used in fountain and aquariums. 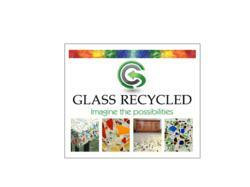 Glass Recycled has been featured on HGTV, DIY and Extreme Home Makeover. To find out more about this cutting-edge product – which is marketed and fabricated in the Dallas-Fort Worth area of Texas and shipped internationally as needed, visit GlassRecycled.com, phone 888.523.7894 or contact glassrecycled(at)gmail(dot)com.